During the last powder puff practice before the game, the sophomore defensive players work to better their flag football skills. Photo by Annie Hsu. The Class of 2021 powder puff players have been practicing this week as they prepare for the Oct. 8 game and a chance to remain undefeated. But the freshmen team plans to bring some competition. “The freshmen team, I believe, is going to be somewhat of a competition. From seeing their players and seeing them at practices, they look pretty strong. But last year, we did beat the sophomores, so I still have hope that we can win,” Brooke Schaefer said. The freshmen and sophomore classes practiced Tuesday, Wednesday, and Thursday after school from 3:30-4:30 pm this week. “I took interest in being on the powder puff team this year because last year I really enjoyed it and it was a lot of fun. Also I learned a lot of new skills and made some great friends, so I wanted to try doing that again this year,” Schaefer said. 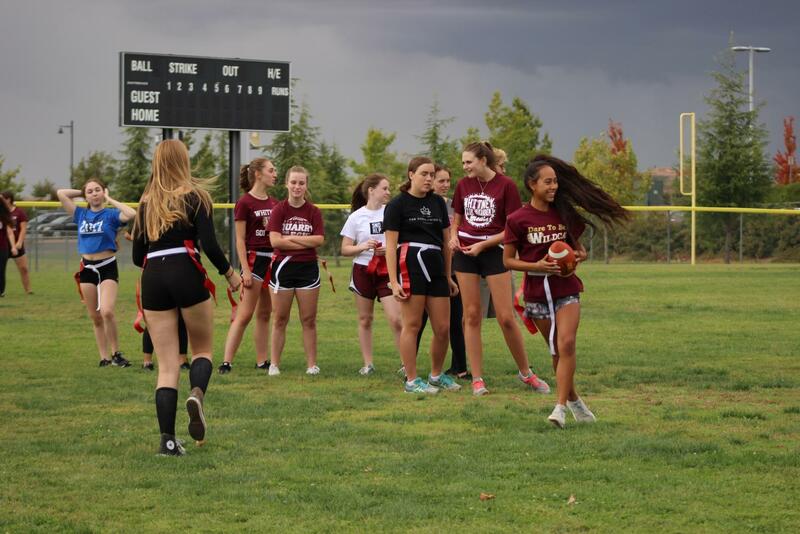 Most of the girls are fairly new to the sport, but their determination to beat the opposing team outweighs their lack of flag football knowledge. However, some have had experiences with this sport, setting them apart from the rest. “I play flag football with my family just for fun, because we are really into football,” Aubrey Murray said. Although a lot of the girls haven’t had much experience with powder puff, they are learning more about the plays and positions in the game and readying themselves for the big game Monday night. “I hope to either be a running back or a wide receiver because I can decently catch the ball and sprint pretty fast. I’m also small, so I can weave through people,” Sarah Mann said. Since both classes have different skills and advantages, the players are expecting an evenly matched game with hard competition. “I feel like the freshmen team may be hard competition because they have Mr. Tod Furtado as a coach and he was the freshmen football team’s coach last year. Also when we saw them practicing yesterday, they seemed like they knew what they were doing,” Mann said. Many players believe that the freshman team has an advantage with Mr. Furtado instructing them, but the sophomore team’s coach, Mr. Bret Hunter, has some experience as well. “I was the head freshmen football coach here from 2005 through the 2015 season, so I did it for 10 years. During that time I was a class adviser for the Class of 2016, and I coached the girls in powder puff through those four years,” Hunter said. The freshmen might reveal some unexpected talent during the game, but Hunter has a lot of confidence in his team of sophomores.